Protea AntiVirus Tools for Lotus Notes/Domino scans and cleans automatically the message body, attached files, rich text fields and OLE objects in Domino mail, keeps Domino bases virus-free. Virus detection is handled by Avast AntiVirus and others. Scanning occurs in real-time, cleaning e-mail traffic of Lotus Domino without slowing down the mail delivery. All infected objects are blocked, regardless of format, archive or compression type. On-demand scanning ensures that databases are virus-free on setup. Fully configurable, scheduled database scanning offers an additional level of protection. 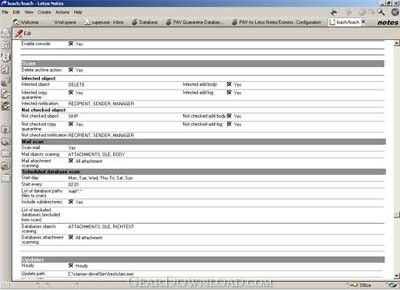 The scanner checks the database in the catalogs specified by the Administrator. It provides automatic virus signature file updates, centralized virus activity logs, and integration with the Lotus Notes administration client. * The Avast scanner is used. * Different antivirus scanners can be plugged in. * Lotus Domino R6.0.1 and higher is supported (Notes/Domino server R5, R6, R6.5, R7 or R8). * High performance allows it to check up to 18 000 messages per hour. * Infected messages can be cured instead of being deleted. * E-mail messages with multiple recipients are scanned once before delivery. No additional per-recipient scans are performed. * The mail messages monitor can process multiple mail boxes. * Infected or suspicious files are isolated in the quarantine zone, preventing network infection. What's New: - improved: Support of ClamAV engine 0.97.6. - bugfix: The bug causing an error during installation in Windows 2008 R2 has been fixed. - bugfix: Bug when parsing scanning time variable in am/pm format. This download (pavta.zip) was tested thoroughly and was found 100% clean. Click "Report Spyware" link on the top if you found this software contains any form of malware, including but not limited to: spyware, viruses, trojans and backdoors. The Shield Pro 2009 - Provides essential virus protection from viruses, hackers, and privacy threats. Protector Plus anti virus software 7.2.H03 - Protector Plus is an anti virus software designed for Windows.